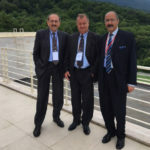 Armenia: The Tavush Region Integrated and Balanced Economic development project held a high level International “Buyers and Sellers” Conference, which took place on 5 – 6 June 2018 in Dilijan City, Armenia. The project was funded by European Union and the Government of Republic of Aramenia and orientated at a more balanced social and economic development between communities of Tavush Region through creating new economic opportunities and jobs, leading to increased diversity and productivity of the economy in Tavush region; and increasing the economic competitiveness of farmer cooperatives and SMEs, including opportunities for investment and trade. The Conference hosted the Government top officials of the Republic of Armenia, representatives of International organisations and local businesses, gather together local producers, active in agricultural/food processing (natural and dried fruits/vegetables/berries, horticulture, tree saplings cultivation, food processing, apiculture and organic honey making, meat and milk processing and dairy, etc. ), agro-tourism and other businesses, as well as local, national and international entities, organizations interested in implementing investment projects in Tavush region. Among our other tasks, being mandated for some viable Investment Projects’ initial development, some pitch decks were promoted, introducing most attractive investment opportunities, which might be interesting for funding by International Investors. CBA Cross Border Associates was presented by Mr. Arsen Sargsyan (Armenia, photo right) and Mr. Heinz-Günther Milz (Germany, photo left).